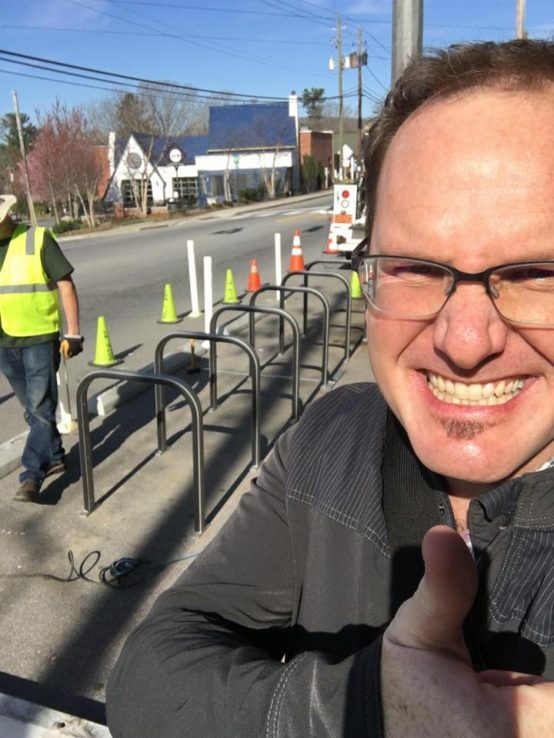 During 2015, The City of Asheville, North Carolina Department of Transportation (NCDOT), West Asheville Business Association (WABA), and AoB partnered to explore the option of providing a bicycle corral somewhere along the Haywood corridor. A bicycle corral is a series of on-street bicycle racks that can provide parking for fifteen or more bicycles. 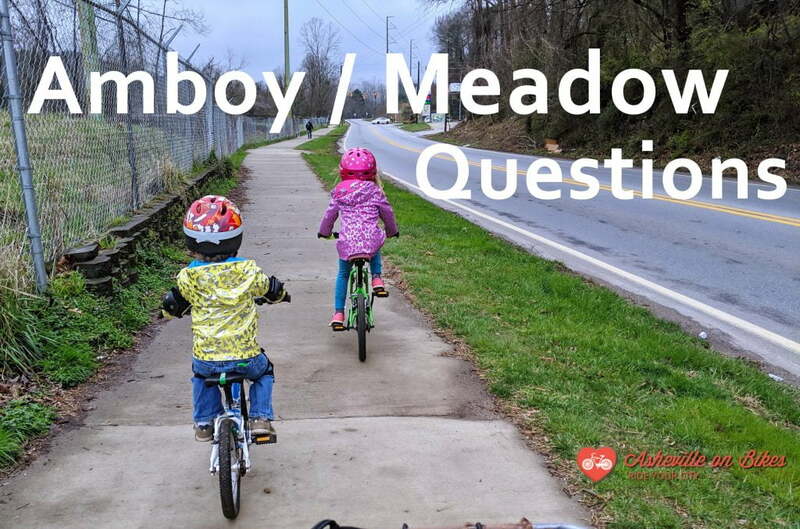 In the summer of 2014 AoB’s director, Mike Sule and Barb Mee, the city’s pedestrian and bicycle coordinator, presented the concept of a bike corral to WABA since Haywood Rd has some of the highest bicycle counts in city. 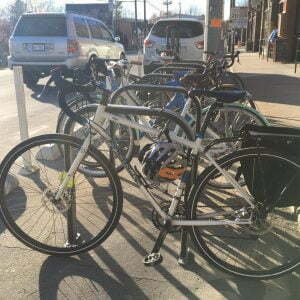 “Following the presentation, everyone supported the addition of a bike corral. Frankly, I was a little taken back that the entire room was ready to move forward with the corral. Generally, there are a few skeptics. It just goes to show, there is tremendous support for advancing active transportation throughout the business community,” says Sule. Once WABA had endorsed the corral, the city was required to secure an encroachment agreement from NCDOT because Haywood Rd is an NCDOT maintained highway. “NCDOT was pleased to have worked collaboratively with the community on the bike corral project, we understand that this is a project of local importance. We were pleased to provide the encroachment agreement,” states Kristina Solberg, NCDOT Division 13 Planning Engineer. First day on the job & a full house. Vice-Mayor Gwen Wisler, who is a bike commuter, herself, and has been active in Asheville’s cycling advocacy will serve as the city’s dignitary at the ribbon cutting. “We are excited for the addition of our first on-street bike corral – installing multimodal infrastructure like this is one is a step toward meeting Council’s vision of a well-planned and livable community, and of transportation and accessibility. The City is also thrilled to have business support of this project,” states Wisler. On Thursday, April 28th the community is welcome to participate in the ribbon cutting to welcome Asheville’s first bicycle corral. The event begins at 6pm. Representatives from each of the partnering organizations will say a few words at the ribbon cutting. Following the ceremony, Westville Pub welcomes all to continue the celebration with music by DJ Jut Rut and a portion of New Belgium Brewing and Catawba Brewing Co. sales dedicated to support Asheville on Bikes. 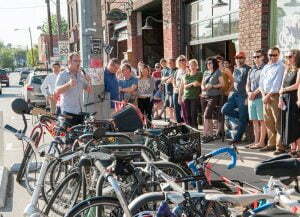 Asheville Citizen Times covers bike corral ribbon cutting.